T-minus four days until Fall ya'll! I couldn't be happier because it means cooler weather, hot coffee, cozy sweaters, and blanket scarves. I cannot believe the number of blanket scarves I accumulated last year! I recently went through all of them and only kept a few that I absolutely loved. I'm planning to donate/sell the others and figure I'll end up with just as many at the end of the season again. 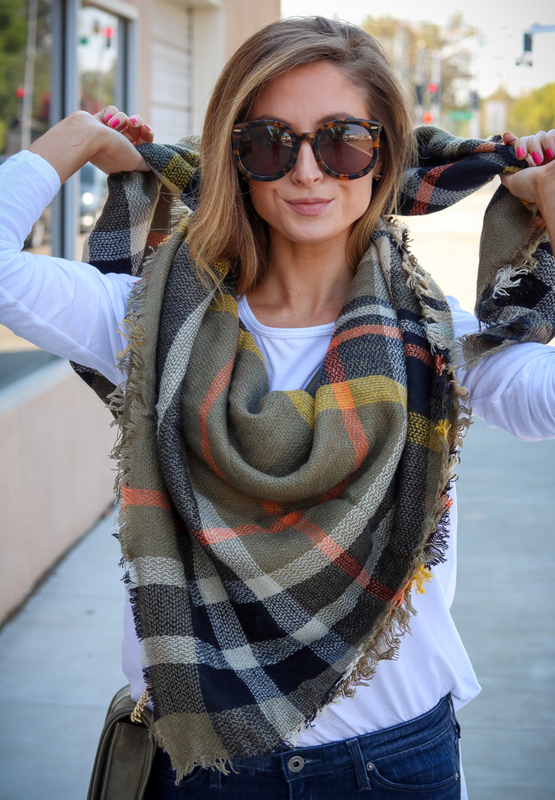 The one I'm wearing in today's post is from ilymix, a fabulous site with every color scarf you can think of and other cute accessories too. 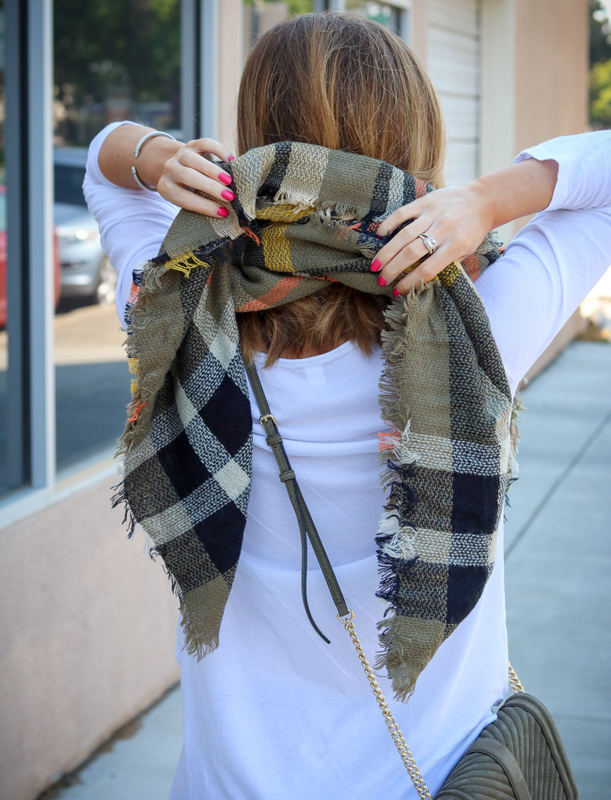 Last year my "How To Tie A Blanket Scarf" post was so popular, I thought I'd share an updated version so continue reading to find out how! 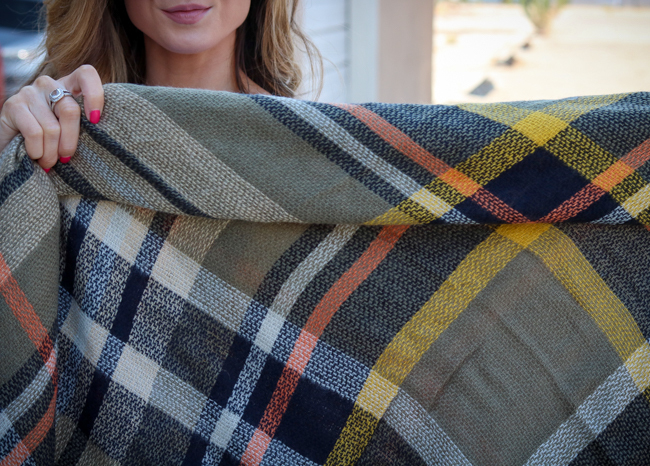 Step One: Hold out or lay flat blanket scarf so that it's a big square. Step Two: Fold in half diagonally so you have a triangle. Steph Three: Fold over the top portion (from the wide end) two to three times. Step Four: With the fold facing you, crisscross the ends of the scarf behind your neck. Step Five: Pull the ends in front of you and lay flat or tuck beneath the front portion. Even though my fall color palette consists of light neutral colors (did you know pink is a fall color this year?! Sooo excited!) 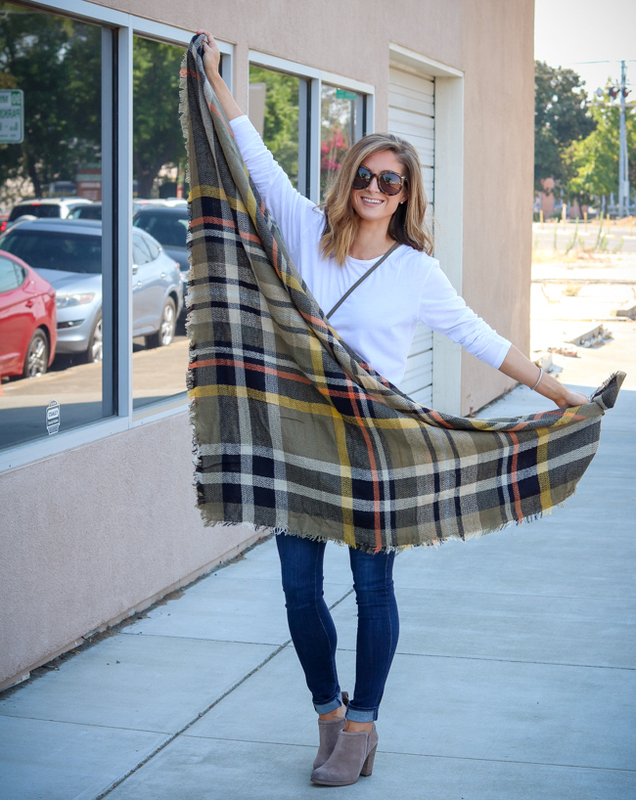 I wanted this olive & orange plaid scarf (get 20% off with the code ILYMIX20) because I love that it literally screams "Fall!" It also pairs well with a simple long sleeve tee like the white one I'm wearing that is only $19 - and so soft! 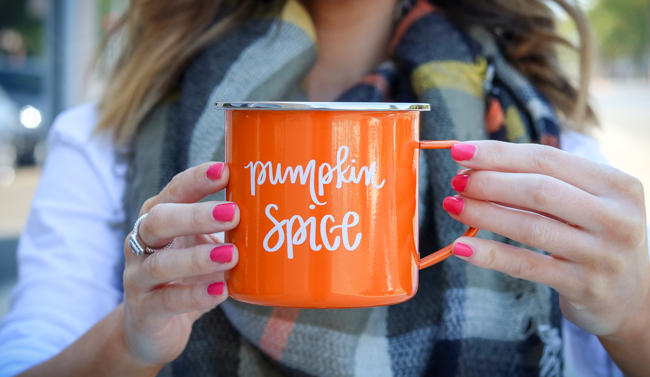 I even have an orange pumpkin spice coffee mug that I can't wait to sip while wearing this outfit... Justin was joking with me when we took these photos because it was obviously empty and I wanted to take a photo "fake sipping" out of the cup haha. He said "why don't you go home and actually put coffee in it?" lol. I've said it before and I'll say it again, my booties are the MOST comfortable shoes I own. I will probably wear them out by the end of the year because it's still summer and I find myself wearing them all the time. You don't need socks and they fit like a glove! Btw I have a narrow foot and purchased true to size. The jeans I'm wearing are my favorite skinny and the highest quality pair I own. I can actually tell a difference when looking through pictures because the fit and fabric is fantastic. Lastly, my olive colored crossbody is one of the season's most popular bags. It sold out during the Nsale and for good reason. It's a perfect size and I love the gold detailing.